Engineered to provide unparallel comfort and security with every step. The ultimate in comfort and safety! 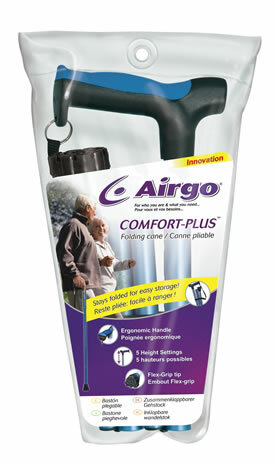 Ordinary canes only offer support, but the Airgo® Comfort-plus Folding cane offers you the ultimate in comfort and safety. Only Airgo combines an ergonomically designed Soft-top cushioned handle with a Flex-grip tip, while offering five height settings to fit you, whatever your height. Try one today and feel the difference with every step! comfort and security with every step.